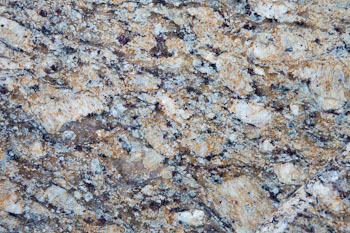 Do you like Giallo Napoleon Granite? The colors on this super-pretty set of Giallo Napoleon granite slabs have given the camera all sorts of grief this week. This set of photos shows close-to-true for the colors in this stone. The coloring is . . . complex, and mixes both warm colors like gold, caramel and cream with cool colors like charcoal and light grey. Mix in some absolutely stunning flecks of an almost-purple and you get a granite that is hard to describe (and to photograph). This stone was selected at Midwest Tile and Granite, located on Braker near Kramer in Austin. 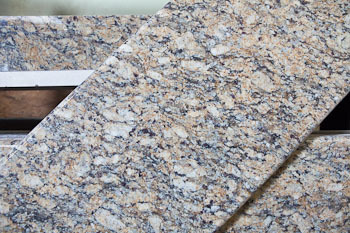 It was delivered to our shop to fabricate into custom countertops for our clients. 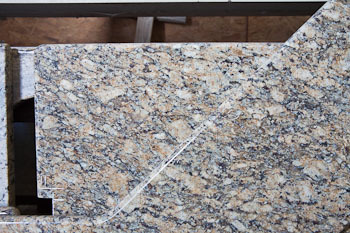 If you are considering this stone for your kitchen counters, you will want to take a bunch of stuff with you to hold up against the slabs at the granite yard. Some good things to take are paint samples, tile samples and if possible, a cabinet drawer or door front. It should look stunning on white cabinets. I can also see it pairing up marvelously with oak, particularly the medium-toned honey oak cabinets that have been popular with builders in many subdivisions in and around Austin. But to be sure, shop with a basket of your stuff that you need it to match. If you take a friend, you can have him or her hold up your samples while you step back from the slab and see if you like the way your paint, wood and granite go together. 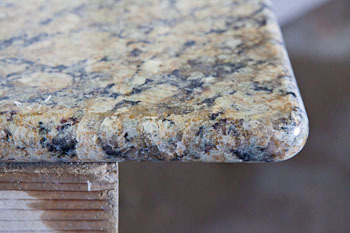 The granite edge profile on these counters is a full bullnose. The edges are rounded on both the top and the bottom. This kitchen has an angled sink, as well as an angled bar, which you can see part of in the photos. Stone like this works better than directional granite when you have wider angles in the counters, like a corner sink cabinet. When you have a directional granite (where there appears to be lines horizontally going across the slab), it can look a little funny at the angles where two counters meet. 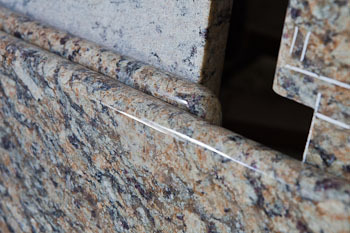 We try to minimize seams in granite counters, but you have to also pick a granite that looks good with how your kitchen is designed. Find Kitchen and Bathroom ideas! Check us out on Angie’s List!